Hassan Nasrallah - Who is Hassan Nasrallah? 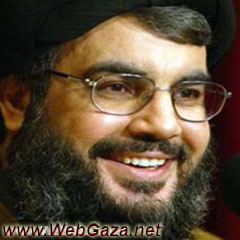 Sheikh Sayyed Hassan Nasrallah is the leader of the Lebanese Hezbollah resistance movement. He was born in 1960 in the Bourji Hammoud neighborhood east of the Lebanese capital, Beirut. Hassan Nasrallah then moved to Najaf in Iraq to study Qura’anic divine sciences at a Shiites school. In 1978, he completed the first stage of his studies successfully inside Hawza (Islamic Seminary), but his studies were interrupted when he was forced to leave by the Iraqi authorities. He then returned to Lebanon, where he studied at the school of Amal’s leader Sheikh Abbas al-Musawi. A few years later, Amal elected Hassan Nasrallah as its political delegate in Bikaa, making him a member of the central political offices. After the Israeli invasion in 1982, Nasrallah dedicated himself to the anti-Israeli resistance and joined Hezbollah which mainly aims at resisting the Israeli occupation of southern Lebanon in the Bekaa Valley. Despite his commitment to Hezbollah, Nasrallah was determined to resume his religious education to become a religious jurisprudent. In 1989, he moved to the sacred Iranian city of Qum to continue his studies. Hassan Nasrallah is married to Fatima Yassin, who comes from the Labanese village of Al Abbasiyee. They have three children remained after their elder son, Hadi, was killed by Israeli occupation forces when he was 18-year-old. The forty-four-old leader said once in an interview that he reads many books, particularly the memoirs of political figures, including the “Memoirs of Sharon” and Benjamin Netanyahu’s book “A Place under the Sun”, with the intention of getting to know his enemies. He became the leader of Hezbollah after Israel assassinated the movement’s leader Sheikh Musawi in 1992. Hassan Nasrallah is considered one of the most powerful and charismatic figures in the Middle East. He is a leader who endlessly fights for the rights of the Arabs and the Muslims. Under his leadership, Hezbollah became a serious opponent of the Israeli occupation. The movements’ resistance was one of the main factors that led to the Israeli withdrawal from Southern Lebanon in 2000, ending 22-years of occupation. Hassan Nasrallah also played a major role in the prisoner exchange deal between Israel and Hezbollah in 2004. The agreement was described among the Arab world as a great victory for Hezbollah and Nasrallah was praised as a hero for achieving gains in the Arab-Israeli conflict that no other Arab figure has attained. For him, Hezbollah isn’t just a resistance group. He believes that it carries a message that depends on the Islamic belief. Nasrallah also believes that Islam can solve all the problems for any society, but he makes clear that the movement doesn’t intend to force people into Islam.